Water, the most commonly used couplant in ultrasonic testing, may not be compatible with certain materials and manufacturing processes. QMI Inc. has therefore developed transducers and instrumentation for the industrial ultrasonic testing and c-scanning through the ambient air. Transducers and technique are presented, together with results from actual applications. Keywords: air-coupled ultrasonic testing, air-coupled ultrasonic transducers, airscan, ultrasonic testing. It is a common textbook knowledge, that a couplant has to be used in ultrasonic testing in order to transmit the ultrasound in and out of the test object (and the transducers). Water is the most frequently used couplant in immersion and squirter scanning techniques. However, these techniques are not compatible with some industrial processes and water may cause permanent damage and contamination to many materials. Couplants are being used as a sound propagation medium between the transducers and the part under inspection. Although air is a reasonably good sound carrier in the frequency region of interest, it poses a major obstacle. The acoustic impedance of air differs so much from the acoustic impedances of transmitter and test parts, that most acoustic energy is being reflected, and only a very small fraction of that energy penetrates in and out of the part and the transducers. One solution to overcome this problem without introducing an additional sound transmitting medium obviously consists in generating high enough sound levels and to use high-gain, low-noise amplification. Transducers for the generation and reception of sound are the most critical components of an air-coupled ultrasonic NDE system. In current commercial applications, we use mainly thickness-mode type, piezoelectric elements. Such transducers are constructed using a circular disk of an efficient piezoelectric material. To take advantage of the high mechanical-quality factor Q of the piezoelectric disk, no backing layers are applied. Frequently, we employ a thin front-layer of a porous material with low specific impedance to improve generation and reception efficiencies. As a consequence, such transducers can be operated in the resonant-mode, resulting in much higher sensitivities. The construction of a typical flat air-coupled transducer is shown in figure 1a. Transducers with high mechanical quality factors Q are best suited for operation in the tone-burst mode. In this case, the center frequency of the driving electrical signal is chosen to correspond exactly to the thickness-mode resonance of the transducer. As a result, the mechanical amplitude of the piezoelectric material is significantly increased and the transmit and receive sensitivities can be increased by as much as 20 dB. Such transducers are necessarily narrow-band and can be operated at one frequency only. Further increase of the sound pressure and sensitivity can be achieved by using focused transducers. Several methods of constructing such transducers are depicted in figure 1b-e. The simplest method, shown in figure 1b, uses a spherically shaped piezoelectric ceramic disk, while the same can be achieved by using composite piezoelectric materials ( figure 1 c). Such disks are also used for water immersion transducers. Figure 1d shows a transducer that uses a flat piezoelectric disk and a refractive lens made of a light material. In figure 1e, the same goal is achieved by using reflective optics. Flat air-coupled transducer, backed by air and with a thin front layer with low impedance. Focusing air-coupled transducer with spherically shaped ceramic disk. Focusing air-coupled transducer with composite ceramic element. Focusing air-coupled transducer. Flat disk with refractive lens added. Focusing air-coupled transducer. Flat disk with reflecting optics added. Figure 2 shows the latest model of an air-coupled ultrasonic flaw detector. The system utilizes a 500 V peak-to-peak bipolar driver with a very low output impedance, which is driven by a 15-cycle burst with 1 kHz pulse repetition frequency. Figure 2. 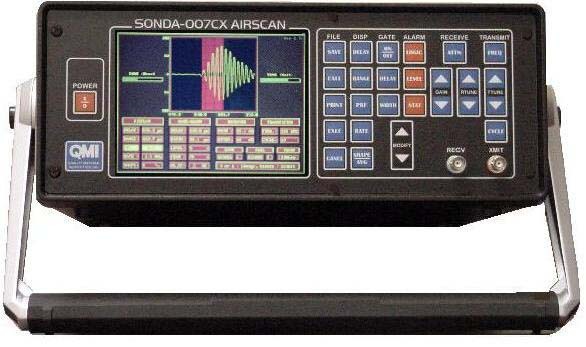 SONDA 007, the commercial air-coupled ultrasonic flaw detector from QMI Inc.. The detected signals are first preamplified using a super-low-noise wide-band circuit with a 32 dB gain, which can be attached to the receiver transducer. The preamplified signals are then scaled using a computer-controlled attenuator and filtered using a narrow-band, tunable amplifier with a narrow bandwidth and amplified again using a variable gain amplifier. At this point, the signals are digitized, using a 8-bit flash converter at a 10 Msample/s rate. Further processing is then accomplished by an internal single board computer, which also controls the display and the permanent-recording functions. The Airscan system operates in a toneburst frequency of 400 kHz, corresponding to a wavelength of 0.85 mm in air. It is also possible to operate the system at 200 kHz and 1 MHz, with small adjustments to accommodate transducer resonant-frequency variations. The Airscan system typically uses spherically focused resonant transducers of 25 mm diameter and 38 mm focal length. The signal-to-noise ratio frequently exceeds 40 dB in the 0.1 - 1 MHz frequency region. Because of this performance, the systems can be operated in real time, without the need for signal averaging. It is particularly useful when inspecting aerospace laminates with complicated internal geometries. Air-coupled transducers can be configured to work in through-transmission, like water-coupled transducers. It is, however, a distinct feature of air-coupled transducers to be able to efficiently generate guided plate waves (Figure 3), which are otherwise rapidly dampened by the water couplant. It is our experience that plate waves play a significant factor in the inspection of many materials and structures. This is particularly the case when inspecting honeycomb structures. Best test performances are always obtained after a careful adjustement of the transducer angles, for one-sided as well as for two-sided inspections. Typical inspections for air-coupled transducers include: Honeycombs, Solar Panels, foam sandwich panels, cork-coated honeycombs, Gr/E laminates, C/C aircraft break discs, timber and wood products. Many more materials are under investigation. Figure 4 and Figure 5 show c-scans of carbon/phenolic laminates. Figure 6 shows the c-scan of a carbon-carbon break disk, and Figure 7 shows the c-scan of solar honeycomb panel. All these examples were scanned in through-transmission with 400 kHz air-coupled toneburst method. It is the combination of specially designed transducers with the proper driver/receiver instrumentation that has made air-coupled ultrasonic inspection a valuable new tool for industrial ultrasonic testing. Air-coupled ultrasonic scanning ("Airscan") is increasingly becoming the NDT method of choice for those parts, where water and other couplants are not possible or not admissible. W.A. Grandia, and C.M. Fortunko: NDE Applications of Air-coupled Ultrasonic Transducers. 1995 IEEE Ultrasonic Symposium, Proceedings, Vol 1, pp. 697-709, ISSN 1051-0117. Hanspeter received his Master Degree in Physics in 1972 from the University of Bern, Switzerland and specialized in laser development and applications, including laser based ultrasonics, and in ultrasonic testing of composite structures.